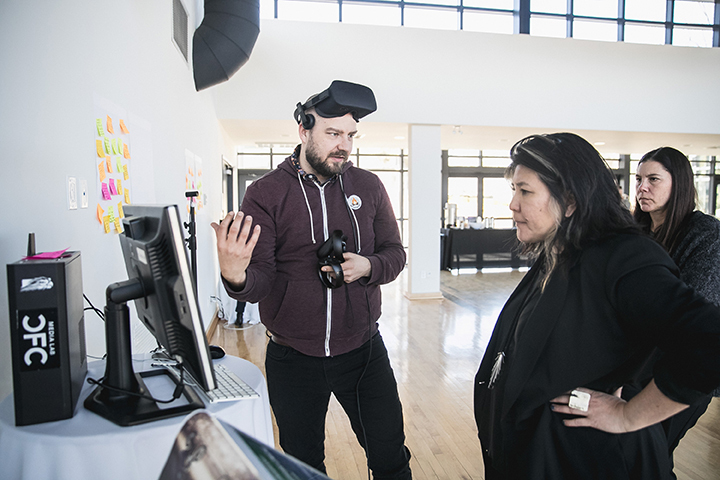 In spring 2018, the Canadian Film Centre (CFC) invited Flipside XR, formerly known as The Campfire Union, into Cohort 7 of their IDEABOOST Accelerator. Flipside XR’s vision is to give the world a creative voice through virtual and augmented reality (VR/AR). 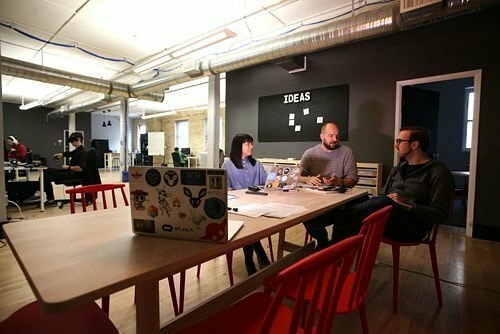 Below, the Winnipeg-based company’s co-founders, Rachael Hosein (CCO), Leslie Klassen (CEO) and John Luxford (CTO), described their creative beginnings as The Campfire Union, and the excitement and challenges of being a startup in a brand new industry. Q: Flipside is a creative tool for creators. Do you consider yourselves to be creative types or techies? Luxford: I don’t think there is a difference between the two. Techies apply creativity to solve problems. The “inner creator” is a part of all of us here. I’m our chief technology officer, but I come from both arts and programming. I write music, perform, all kinds of stuff like that, but I also write code, which is another creative outlet. Klassen: I come from a theatre/film/tv/light art/whatever’s floating my boat creatively background. I also have some formal schooling in business and programming. Hosein: I come from an art and digital media background. I went to school for digital multimedia design, which led me down the branding/art direction/marketing material road. Q: How would you describe your current product to someone who’s never heard of it before? 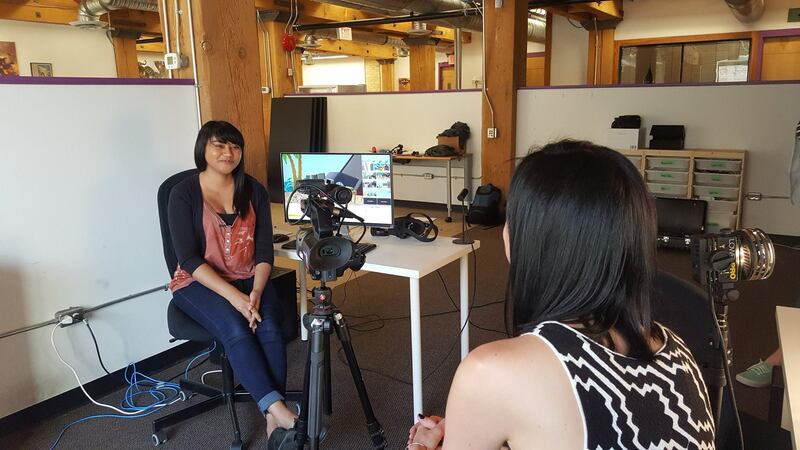 Klassen: It’s an animation studio designed to help people make VR content. People can make shows, create experiences, and also allow other artists and creators to create content for a medium for which it’s difficult to create. Q: When you say VR shows, does that mean I’m in the show? Asking as a newbie. Luxford: A VR show is hard to describe. At the simplest level, it’s like watching a TV show, an audience watching performers, but now it’s in 3D and all around you. So it becomes something you can interact with. We’re also exploring how the concept of a show gets turned on its head because of VR. It also depends on the show’s format. We have ideas now [about] how these shows are supposed to look, but the future is evolving . For example, on a game show like The Price is Right, one is in the audience and can “come on down” to participate. Another example would be more passive content, watching 3D animation play out. Some interactions here may involve seeing a cartoon character go down a path, and then the viewer places an obstacle in front of it. Or simple, recorded branching scenarios, in which the viewer explores an idea or experience. It could go in all sorts of directions. The app has two parts. First, there’s the studio, which we launched in the spring of 2018, and to which we’re always making improvements. Right now our goal is to connect with a large creator community and give them the resources to make shows. Second, right now we’re working on another part designed for consumers to experience the content. We’re busy building up the creator side of our app, and we’ve got some development plans and strategies for opening up the consumer/viewer side. Photo by Brian de Rivera Simon. Q: Flipside began as The Campfire Union. Among your projects, there was a collaboration with the Canadian Museum for Human Rights (CMHR). Do you see applications like this one for Flipside, too? Hosein: Absolutely. What we did with CMHR could be a show in our Flipside viewer app. Content may not be entertainment in the classic sense of “I’m going to watch a show and laugh my head off or cry my eyes out.” It’s entertainment because one is engaged. Klassen: We did another collaboration, a music video with a popular group called T3R Elemento. They are a Los Angeles-based Mexican band whose lead singer is the Justin Bieber of Mexico. We used our technology to make their video. It’s a good example of what we’ve been doing lately: a combination of user-generated content and us working with project partners who align with our vision. Q: Beyond putting this neat tool into people’s hands, why does the world need Flipside XR? Luxford: We looked at VR and where the technology is. It parallels where film was 100 years ago when they were just discovering the language of film, such as the frame, cuts and movement. Right now with the technology, one needs to be a programmer or skilled 3D artist to engage with VR. Yet there are a lot of people who just want to make content. They may have an idea, but they’re kind of locked out of the medium. If we hand this tool to them, then we’re making it possible for more people to join the conversation and that process of discovery. The language of [the form] will mature faster because of Flipside, and more people will get to participate. Hosein: We’re interested in reducing barriers and providing people the tools to do something new. That’s the focus of Flipside Studio. Once we get into the viewer app, we want to provide a different way to interact with things by which they’re entertained. People once watched TV, and then YouTube and streaming came about, allowing people to comment and, in light ways, affect the outcome of what they’re watching. XR provides another, more substantive way to interact with content. For example, maybe I can vote on something when I’m sitting in the space with the actors that I’m watching, or do something that will affect the set they’re on, or see behind the scenes, or watch the show at any angle to get a different perspective. We want to provide a way for viewers to become more of a part of the narrative. Klassen: We want to give creators the agency to make what they want, as well as give viewers the agency to consume content the way that they want. Q: You recently participated in the CFC Media Lab’s IDEABOOST Accelerator’s Cohort 7. What did the company take away from this experience? Klassen: What I really liked about IDEABOOST is that it’s a training and education-driven accelerator. They focus on skill development and for us, helped with the practical execution of our business idea. Other accelerators, by contrast, may provide access to their network, but they don’t give as much business development support. That is unique to IDEABOOST. Also, given that it’s an accelerator focused on media, us founders could connect with other media startups. There are unique challenges to working in entertainment and media. Hosein: One thing I found great about working with the CFC is that they take a genuine interest in what you’re doing. I was floored the first time we went out to visit them in Toronto. These people knew our app, they were pitching our app, and they seemed like members of the team. They took the time to understand our direction, and they could demo it to people like they had been here since day one. That was unbelievable to see. Luxford: They really would go out of their way to find solutions. If we were demoing somewhere and we needed an extra cord or some extra equipment to make it happen, that was no problem. They consistently go above and beyond for you, which is wonderful. Q: Describe some of the highlights and challenges of your journey with the company so far? Klassen: We’ve been doing this for five years, so we’ve had whole different iterations of our own company. The challenges and highlights depend on where we were in the process. Early on, some of our highlights included being Oculus social partners. We were one of the only companies in the world who had access to a code base that Oculus shared with us. They let us be beta testers of some early software. So our relationships with partners like that have been valuable, definitely a highlight. One of the challenges has been keeping up with the technological changes of a new industry and always learning new skills, which we weren’t anticipating. For example, when we had to optimize our application for mobile, we had to learn a whole new set of skills. Then a new piece of hardware comes out, with a whole different set of technical requirements. As this industry evolves, we have been here from VR’s start. So we’ve continually upgraded our skills. It’s different for companies that already have an established medium, market and developer tools. Just a few days ago, for example, we received new information for a new piece of hardware that we’re developing for, which will require us to learn new skills. It’s tough to develop in an emerging medium. Hosein: I think for me, a huge highlight was when we made the move from The Campfire Union to Flipside. It’s weird, because it was a positive step, but sad, too. As The Campfire Union, we spent several years working on some amazing projects with clients while funding our own VR endeavours. That was building up to Flipside. Once our company was stable enough and Flipside was coming together, we had to say farewell to The Campfire Union and devote all our energy to Flipside – so that was a huge highlight and reflection point. Luxford: That was bittersweet. We were finding our voice, but we also had to let go of something to which we were attached. A lot of our identity, maybe our whole identity, was wrapped up in The Campfire Union, and that transition? Well, bittersweet is the right word. Again on the challenges side, being in an emerging market you’re a kind of guinea pig, and also at the mercy of the market’s growth rate. Most of the time, when we’re demoing, we’re really selling headsets for someone else [laughs]. That’s the first step in the sale, and if you’re making a web app, you don’t have to worry about any of that. One needs to love working under extremely difficult and often conflicting constraints, finding creative solutions within that can be frustrating or at other times, really rewarding, like when you find that you’re able to do things you didn’t think were possible. Q: As creators not only of art, but also the tools to make it, you get the pleasure of seeing how your tool is being used. How do you react to what people are doing with Flipside? Has anything surprised you? 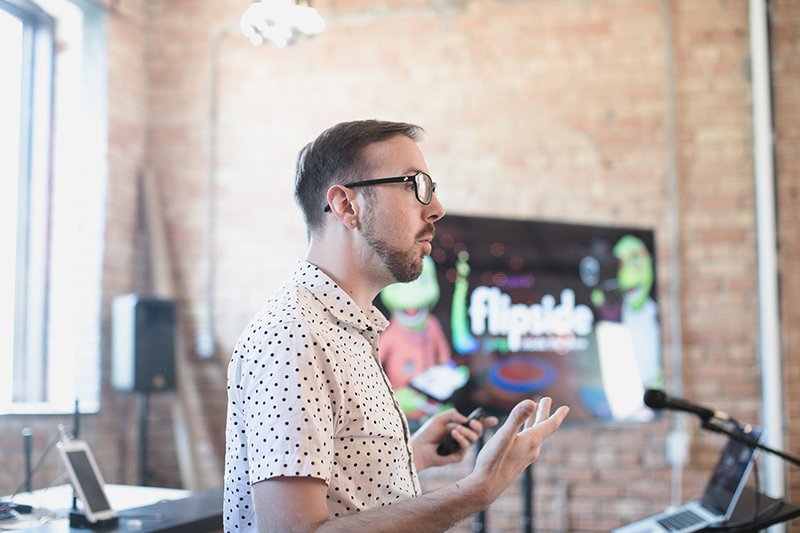 Klassen: I remember the first time somebody shared something they made on Flipside. It brought me to tears. We’d been working on something for so long. When someone else expresses their ideas inside of that work, I found out how it feels to give someone else the ability to create. The first time I saw somebody do something with our product was really powerful. Hosein: I’m always surprised when I see what people are doing, because stylistically, our users have different approaches and they’re creating a wide spectrum of content. We’ve had everything from talk shows to comedy to quasi-public service announcements. There’s a breadth of types of content. Luxford: On the content side, I’m amazed that we see it being used for some sensitive, deeply personal things that probably wouldn’t have been made if it were a person standing in front of a camera. As soon as they gain the façade of a character they can embody, they can be something else, or they can more safely express something that would normally make them vulnerable. There have been several things that have affected me deeply because of that. It’s made us realize what a sacred thing it is to hold someone else’s creative capacity. It’s really important for us to take that seriously. On the tech side, we also give people the ability to bring in their own characters and their own sets, props and things too. Every time we add even a tiny thing, we see it through our lensof how it’s going to be applied. We gave people the ability to make something into a prop and think, “They can pick stuff up now.” That’s as far as we had thought, at that point. Then someone attaches a light to it and makes a flashlight; in hindsight, we see how that was possible. We’ve learned how narrow our view of the world can be, but also how it just takes one other person to go, “Oh cool, now I can do this!” And they can just run with it, in so many different ways. Every time we release something new, I get so excited to see what they’re going to show us that we didn’t realize could be done with the tool.